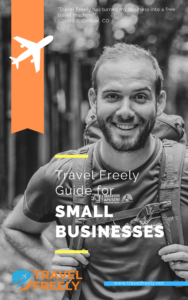 Today I want to share one of my favorite topics with you: how to fly business or first class with points and miles. Flying business or first class with miles is one of my favorite uses of points and miles. It helps me get a ton of value for my points and miles and really rounds out a trip. There’s nothing quite like knowing you can begin relaxing from the moment you get to the airport. Especially for long trips. I just returned from a trip to Vietnam where I flew Korean Air first class and Cathay Pacific first class. Flying in a premium cabin let me get some great food and comfortable sleep, so that when I arrived to my destination I was well-rested and able to get going. When you fly business or first class with miles, you can adjust to jetlag much easier in the air so that you don’t lose out on precious time at your destination. If you’re like I was when starting off with points and miles, I didn’t really know what the difference was between first or business class. Especially if your only experience is on domestic or short international flights. To help show you why you might want to consider flying business or first class with miles, I’ll first walk you through the differences. Then we will look at how you can use miles and points to fly business or first class. When people hear first class, their initial impression is often that of domestic first class. A bigger seat with a bit more leg room, and sometimes a meal. You should get that image out of your head. When we talk about flying business or first class with miles, we are talking about long-haul international destinations. The value you get on a domestic or short international flight (think flights to Mexico, Canada, and Latin America) really aren’t that great. And the product you’re getting isn’t anything special either. Instead, here we are discussing international business or first class. This is what you will get on flights to Europe, Asia, and many flights that can be 7, 10, or even 15 hours long. On these long flights the product that you get is really outstanding. Business class on a long-haul international flight is about comfort. You should expect a seat that has ample space to stretch out, and that will turn into a flat-bed for when it is time to sleep. You’ll be served complimentary meals and beverages (including alcohol) for the duration of the flight. The business class cabin will be more spacious per passenger. You won’t be cramped, and you’ll have plenty of space to stretch out and sleep. Plus, less passengers means less people trying to use the bathroom. 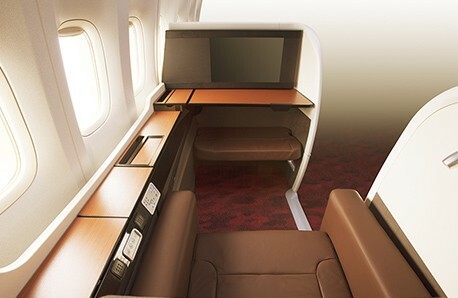 You’ll likely never see a line forming as most cabins will have 2 bathrooms for the 20-30 passengers in business class. However, not all business class products are the same. 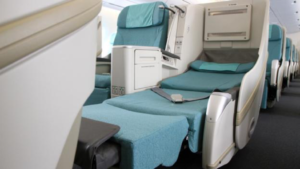 There is a wide variety of seats that you can receive in business class, and will depend on the airline you’re flying. Most airlines offer lay-flat seats on their long-haul flights now. However, if you’re getting an older aircraft you may end up in an angle-flat seat. A good way to check is to enter your flight information on Seat Guru. It will tell you if you’re in a lie-flat or angle-flat seat. The difference is an angle-flat seat will turn completely flat, but at an angle. So it won’t put you in a natural flat sleeping position. This is the biggest factor, as a lie-flat will help you get much higher quality sleep. Typically, you’ll be on lay-flat for long-haul flights on all major carriers. Following that, direct aisle access comes in next. Many airlines arrange business class in such a way that each seat can directly access the aisle. This really impacts the quality of the experience, especially if you are traveling solo. For couples traveling together, it may not be as big of a deal. If you are traveling solo on an airline that doesn’t have direct aisle access from every seat, you may have to climb over sleeping passengers to get to the restroom or have them try to climb over you. This can really detract from the comfort aspect, even if you have enough space in each seat. Some airlines are known for not having direct aisle access from every sleep. 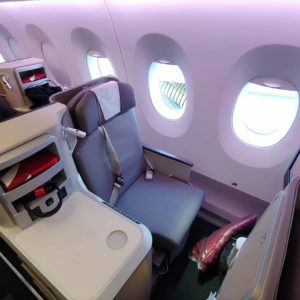 Emirates, Lufthansa, and Turkish airlines especially, but Turkish and Lufthansa have announced updated business class cabins that will have direct aisle access in the future. For now, however, you won’t find yourself with direct aisle access on long-haul routes with these airlines. Finally, what really makes some business class seats stand out are whether you get a private suite or an open seat. Once reserved only for first class, many airlines are starting to drastically improve their business class seats by adding doors that will close to provide you your own suite in the sky. Delta and Qatar have some of the best enclosed suites in the business that rival those found in first class on other airlines. Sounds nice, right? Quite a step up from economy where there are often 4 seats per row, squeezing passengers into smaller and smaller spaces. So if business class is about comfort, what is first class about? If business class is about comfort, first class is about luxury. By default, with just a few exceptions, all first class seats will have direct aisle access and be a lie-flat bed. Not all first class seats are private suites, but that doesn’t necessarily make them worse than those that are. Remember, where business class is about comfort, first class is about taking that comfort and elevating it to a truly luxurious experience. Your meal transforms from a good dinner to a five-star dining experience. Airlines such as Cathay Pacific offer caviar service, premium champagne that will often cost $100+ on the ground, and meals that will make you forget you are on the ground. You also won’t be relegated to the dining schedule set by the airline. With dine-on-demand some airlines like Qatar and Etihad will cook for you whenever you want. Etihad even has a chef on board who will prepare whatever you want, given the ingredients are available. When I flew Etihad first class, I had the chef make me some parmesan truffle fries to go with my filet mignon. Don’t let Cathay Pacific First Class fool you – it is very luxurious and comfortable. The bed goes from being a place to sleep to being truly comfortable. On my trip back from Vietnam recently I flew Cathay Pacific first class and had such a comfortable bed I slept mostly undisturbed for 9 hours! It messed up my plans for adjusting to jetlag, but I was exceptionally comfortable. While some business class seats have enclosed suites, there are some spectacular first-class suites available. Etihad has what they call “The Apartment,” and Singapore offers Singapore Suites. Both have a chair for you to sit in while awake, but have a completely separate bed. These suites can be up to 40 square feet or bigger. You will never be short of space. Other amenities become available for first class passengers. From separate bars and lounge areas, to showers on the airplane. Yes, you can take a shower on an airplane if you’re flying Emirates or Etihad first class. For first class passengers, the perks don’t stop on the airplane. In fact, they can start before you even arrive at the airport. Some offer complimentary car services that will pick you up from your house or hotel and take you to the airport. Once at the airport, you’ll have a separate area for check-in and security – avoiding lengthy security lines. You will find yourself having access to lounges that include showers, spas, and restaurants. If you have a short connection, some will even pick you up from your plane with a car and drive you to your next flight. Keep in mind, whereas business class is a fairly consistent experience with small differences among airlines, first class can vary greatly. American Airlines flagship first class feels like a good business class option compared to what is offered on Thai Airways, Garuda Indonesia, or Qantas. If you’re going to be booking first class with miles, be sure to do a bit more research before booking to know what to expect. It might not be worth it to spend more miles to fly first class with every airline. Which Should You Choose: Business or First Class? So you’ve decided to fly a premium cabin, but which should you choose: business or first class? While first class is truly a remarkable experience, it really isn’t necessary. You get all that you need in business class. It will still be far superior to any economy flight you’ve ever taken. The Etihad Apartment is a wonderful first class experience. First Class will also require a lot more points than business class, sometimes twice as many points. It can be hard to justify first class when you can get two business-class tickets with the same amount of points. Finally, award space comes into play. Airlines don’t release a lot of first class award availability. Some, such as Lufthansa, won’t release any award space until 1-2 weeks before departure. If an airline has 6 first class seats, they want paying passengers in those seats. Giving 2 seats away for free is one-third of the seats that could have paying passengers in them. 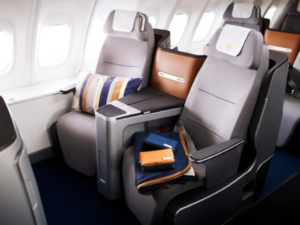 Business class tends to have better award availability – and that may be the deciding factor. Especially as more airlines remove first class all together. You won’t find first class on Delta, United, Air Canada, and many other carriers. They have decided to make business class their top-tier offering. 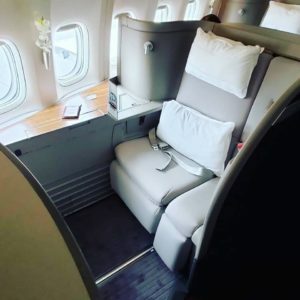 With more airlines having more seats in business class than in first, you’ll likely be able to find business class award availability when you can’t find first class. Now that you know the differences between first class or business class, you need to know how to fly business or first class with miles. The first thing you’ll need are more miles. Thanks to sign-up bonuses you can get enough points to fly first class with miles much faster. In general, business class flights will cost around 50,000-70,000 points one-way and first class will cost 70,000-115,000 miles depending on your destination. This will also vary based on what program you’re booking with. You’ll generally never book a business or first-class ticket through a portal such as the Chase Travel Portal. Business class flights typically run $2,000-$5,000 round-trip and first class runs $10,000-$20,000. 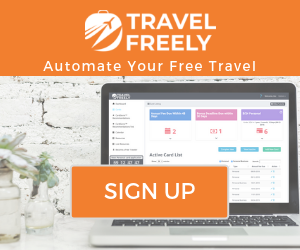 If you redeem at 1.5 cents each, that would require 300,000+ points to fly business class, or more than a million points to fly first class with points through the Chase Travel Portal. You’ll always want to use transfer partners for award flights. Finally, you’ll need to find award space. There is a learning curve for searching for award space. This learning curve can take some time to master, but I encourage you to practice learning! However, if you’re struggling or need help, consider an award booking service. We have partnered up with Juicy Miles to help provide you with an award booking service to take the pain out of searching for award space. With all of this info in mind, here are a few sweet spots for flying business or first class with miles. These sweet spots can help you decide where to take your first flight in business or first class with miles! ANA First Class to Japan – using the Virgin Atlantic award program you can fly ANA First Class to Japan round-trip for only 120,000 miles. Virgin Atlantic is a transfer partner for many banks including Chase Ultimate Rewards transfer partners and American Express Membership Rewards. Keep an eye out for a transfer bonus from American Express to Virgin Atlantic which can help you fly first class to Japan for less than 100,000 American Express Membership Rewards. Iberia Business Class to Europe – using Iberia’s Avios award chart you can fly business class to Europe for as low as 34,000 miles one-way. Iberia is a Chase Ultimate Rewards transfer partner as well as an American Express Membership Rewards transfer partner. American Airlines Business Class to Peru – American Airlines splits South America into two regions, and Peru is in region one. Flying business class will only cost 30,000 miles one-way. American Airlines isn’t a transfer partner of any major bank, but with 4 sign-up bonuses available it is easy to earn enough points to fly business class to Peru.